After my first New Life Servant post, someone said, "You need to say something about Mark Rainey." I thought that was a good idea then. Yesterday, however, it became necessary. As you can see in the picture we cut down a couple trees at Robinwood. Mark was there to work on the furnace. I was there to cut down the trees. Almost as soon as we began my chainsaw quit. No fear, Mark just happened to have one in his car! So he took up where I left off. His chain was so dull that it couldn't cut the tree, mine wouldn't run. So I went home to fix mine. He went out and bought a new chain. Well, I couldn't fix mine. So, we cut down two trees with his saw. Mind you, he only signed up to check out the furnace. 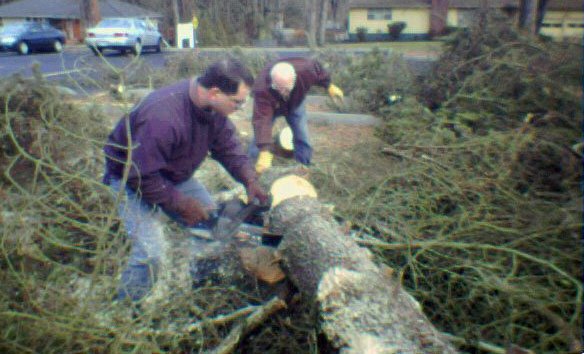 Chuck Gatewood actually cut the big tree down and Paul Reyes took his turns with his chain saw. But Mark worked all day on the trees. All of this, in my book, was above and beyond the call of duty, especially for a guy who has chronic back pain. But this morning he was the first to stand up and give testimony of God's faithfulness. He stood up and thanked God for the opportunity to serve! All I could say was wow (as I rubbed my aching muscles)! Thank you, Mark.